The island climate promotes the growth of the zibibbo, a grape variety that is cultivated there since the Phoenician period and used to produce the famous Moscato and Passito. 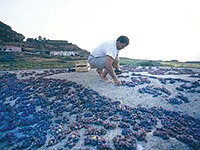 The Passito of Pantelleria, DOC since 1977, is produced from ripe zibibbo grapes whose wine is naturally very sweet. You do not need to add anything: it is a very special dessert wine with an intense fragrance, nuances of honey, dates and ripe fruit, and a sensual amber color. It has an alcohol content of 20% and is best served in tulip glasses at a temperature of 10°-12°. Its hot, soft and velvety taste, exalts cheeses and sweets of all kinds.